There are several feast days which may pique your interest. On the 8th of February it’s Chinese new year, and as ever I’ll be hoping to get down to Chinatown to see the festivities. We are entering the year of the monkey, which I always enjoy as that’s the sign I was born under (#biased). On Tuesday 9th it’s Shrove Tuesday and I’ll be looking forward to lots of pancakes to mark the day. Wednesday 10th is Ash Wednesday and the beginning of the Christian season of Lent; very early this year! The 14th is Valentines, with stationery shops and florists up and down the land hoping for a romantic surge. Anything to do with romance and love – from flashbacks to weddings to thrifty date ideas to Valentines gift posts – it’s definitely the season! I love pet posts at this time of year. We tend to stay closer to home in the colder seasons and it’s a fun time to turn our focus towards our furry friends. It’s Library Lovers’ month, so if you’re a bibliophile this might be a lovely theme to write on. Both the Superbowl (7th) and the Oscars (28th) could provide some lovely blog fodder, if either sports or films are your bag. It’s National Heart Month, so as well as the soppier side of things, this can be a great time to talk about heart health and staying healthy. So important. It’s a Leap Year! I always think Leap Days are a little quirky and fun, so I’ll be planning some silliness around this. It’s Snack Food Month, so sharing some of your favourite snacks, publishing a recipe for a new snack, or devising some healthy twists on snack favourites would all make for some lovely content. If you give something up for Lent, I think a post on this can always be lovely. By February, people’s motivation with new habits and goals may be waning, if they’ve made it this far, so I think February is a great time for boosting people up with healthy recipes, advice posts, and inspirational stories. If like me you’re obsessed with Parks and Recreation, I’m sure a ‘Galentines’ post might make your editorial calendar around the 13th! As we’re still in the wintery months, home posts are always nice at this point – cosy interiors to inspire. I also like to get plenty of ‘before’ shots ahead of the spring cleaning I usually kick off in March. Special days can be fun to commemorate if they fit with your likes, passions, causes or hobbies. As well as the festivals I’ve mentioned above, there are also lots of food based events for bloggers who write on this. The 4th is Homemade Soup Day, on the 6th you may wish to mark Ice Cream for Breakfast Day; on the 7th Yorkshire Pudding Day arrives, and then you could round off the series on the 9th with National Pizza Day! The 18th brings a personal favourite of mine (Drink Wine Day), just in time to enjoy that ahead of London Beer Week which begins on the 22nd. Fairtrade fortnight concludes the month’s foodie proceedings, kicking off on Monday 29th. Here in London there are lots of events to look forward to as well. At Kew Gardens their orchid festival begins on the 6th (running till early March), with hundreds of beautiful flowers to enjoy. On the 9th restaurants across the city will be serving up pancakes of every shape, size and flavour, and in Westminster the Rehab Parliamentary Pancake Race will be taking place (it looks hilarious!). The Southbank Centre hosts the Imagine Children’s Festival from the 10th – there are dozens of wonderful sessions for little ones. I especially love the look of those on the Roald Dahl theme! At the ExCel centre from the 11th-14th, those who adore the two-wheeled life may wish to check out the London Bike Show. According to the website, there are Triathlon, Dive and Outdoor Adventure shows happening at the same time! Chinese New Year brings many events to town (check out this Time Out piece for further details). I’ll be hoping to get into the West End on Sunday 14th to see the main parade. At the end of the month, London Fashion Week and London Fashion Weekend will bring a rash of fashionistas to town! 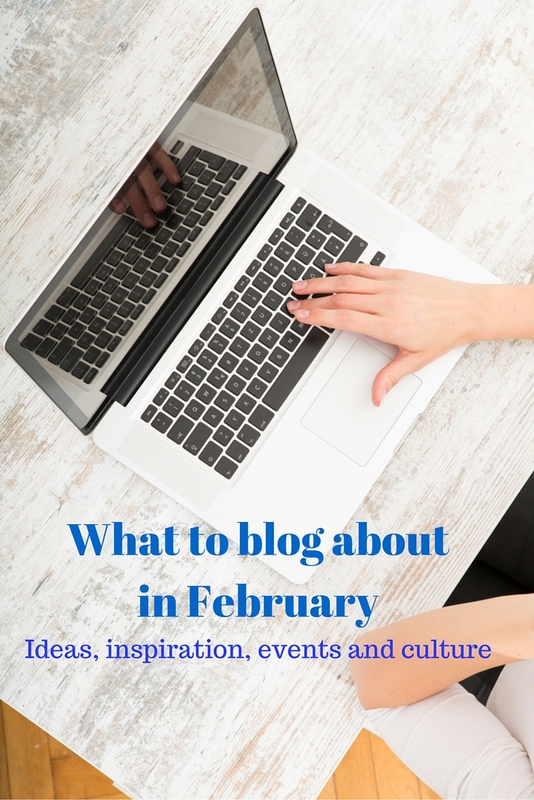 I’ll blog later about some of the cultural elements I’m looking forward to in February, but I hope you’ve found some inspiration here for your February blogging. Have fun!